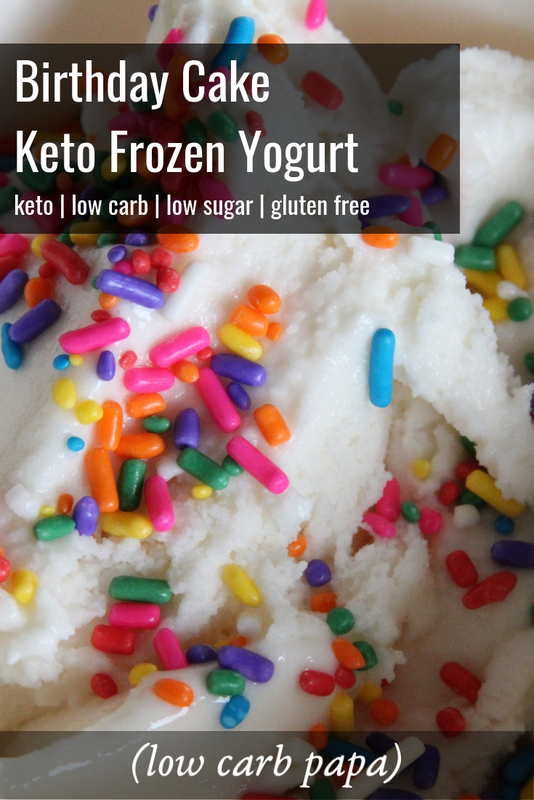 This creamy keto frozen yogurt has all the birthday cake batter flavor you love from conventional ice cream, but without the milk sugar. It will work with store bought greek yogurt, but you should also try your hand at making your own. So, why should you bother with frozen yogurt when there are tons of great keto ice cream recipes out there? The reason comes down to one thing: residual sugar content. 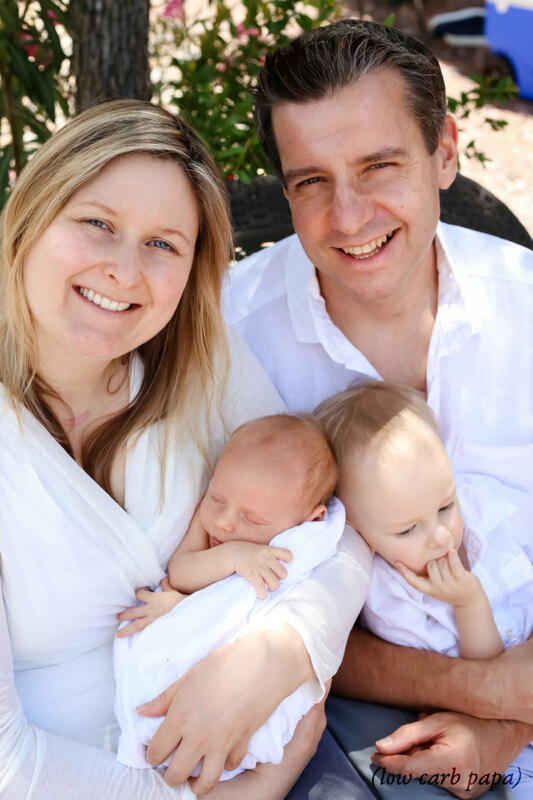 The primary reason is that the yogurt making process consumes the milk sugars (lactose) that constitute the carbohydrate content of milk products. An equivalent volume of yogurt will always be far lower in carbohydrates than conventional dairy. The natural tartness of yogurt also just appeals to me personally, especially because I have the option of backsweetening with natural sweeteners like erythritol and stevia to balance the sour flavor of unsweetened yogurt. Where Do I Find Keto Sprinkles? Keto sprinkles are a bit of a tough get. Ultimately, I have taken the approach of using full-sugar sprinkles portion controlled to assure that the carbs they contribute to the final tally are insignificant and amount to a rounding error. There are definitely other feasible approaches if that is not what you want, though. Amazon does have some options in this department, primarily from a company called Quality Sprinkles. At the time I am writing this, there does not appear to be a retail size mixed colors pack, so you will have to buy colors separately or purchase a much larger mixed pack. Sprinkle Some Fun has a whey protein and glucomannan powder recipe sweetened with stevia. However, could you see me piping out lines of sprinkles one at a time and them breaking them up by hand? Me either. If you’re baking inclined and really want to take an axe to the carb content of your sprinkles, this is a workable option. Most importantly, they also look great. This recipe works out perfectly with store bought whole milk yogurt, especially greek yogurt. I do want to urge you to try your hand at making your own yogurt, though. The second is that the whole reason for even going the route of keto frozen yogurt vs ice cream for us is primarily about residual sugar content. Making your own yogurt allows you to ferment your yogurt to a more complete endpoint, lowering it’s residual sugar content considerably. This Birthday Cake Keto Frozen Yogurt post contains affiliate links, paying me a commission from purchases made through them, at no additional cost to you. Frozen yogurt is a natural fit for keto dieters with its lower residual sugar than conventional dairy. This froyo has all the birthday cake flavor nostalgia you crave and none of the sugar. It works with a store-bought greek yogurt like Fage, but you should try your hand at making your own. Stir the yogurt until with a whisk until it is more of a liquid consistency and loosely pourable. Add the salt and stir until incorporated. Add the powdered erythritol and stevia glycerite and stir until incorporated. Stir in the vanilla and butter extract flavoring until incorporated. Add the xanthan gum to the salt shaker and shake over the top of the yogurt evenly while stirring with the other hand. Keep it moving! Xanthan gum is powerful stuff and will clump otherwise. Rest the froyo batter in the fridge way in the back for at least six hours and preferrably overnight. Spin the frozen yogurt in your ice cream maker according to the manufacturer's instructions, adding the sprinkles at the very end only to incorporate. Freeze until firm. Remove the ice cream and warm slightly, preferably gently in the fridge, until scoopable. Serve. I used regular sprinkles with all sorts of naughty non-keto ingredients in this recipe since the serving size was very small and they are readily available. That being said, you can find sugar free sprinkles from Amazon.com here. I use powdered erythritol here since I am not heating the yogurt batter prior to chilling and erythritol is notorious for being resistant to dissolving, particularly when cold. Grinding it down in a bladed spice grinder gives us a much-needed head start on that. No Replies to "Birthday Cake Keto Frozen Yogurt"